Another weekend where the turbocharged cars dominated ended with Alain Prost securing his third win of the season from Alan Jones, while Carlos Reutemann regained the championship lead. The race was also memorable for a spectacular accident involving John Watson. Jones, whose title defence had fallen away and whose relationship with team-mate Carlos Reutemann was strained to say the least, arrived in Monza with his right hand bandaged after breaking in bone in a fight with two youths after an altercation in London. "It's probably costing me half a second a lap," he admitted after the first practice. "You could say I am having rather a fraught day." But come race day he was at his best. Prost, who qualified third, shot past Rene Arnoux and Reutemann at the start, and he led through to the finish. As rain came and affected certain parts of the circuit, drivers' set-ups came into play. Some dropped back, others climbed the lap charts including Jones who was on a charge. Arnoux, who was in second, slid off into the sand as he tried to avoid an abandoned car. On the 20th lap Watson ran wide on a right-hand curve and spun into a barrier after clipping a curb. The McLaren burst into flames and broke in two, the rear end being flung back across the track where it took out Michele Alboreto who hit barriers as he took evasive action. Watson was able to step out of the remains of his car and walk away. 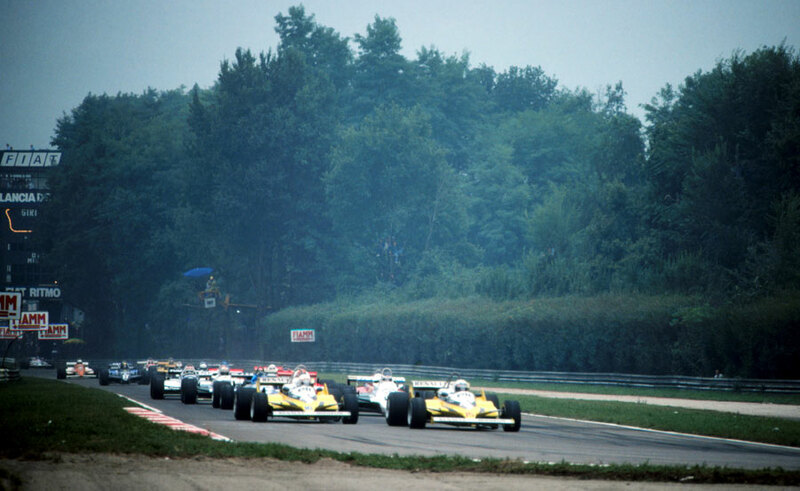 As the cars started the last lap with Prost and Jones clear, Nelson Piquet appeared to be on course for third after holding off a determined challenge from Reutemann. But Piquet's Brabham suddenly started belching smoke as his engine died, and he came to an immediate halt. He was credited with sixth because Andrea de Cesaris, who should have taken that slot, spun off on oil from Piquet's car. Piquet's ill-fortune meant Reutemann headed into the last two races of the season with a three-point lead in the drivers' championship, with Jones and Prost tied for third 12 points off the pace.